Magog, Quebec, Canada (Apr. 2, 2019) – Camso today announced the launch of its new Steel over-the-tire (OTT) track solution, confirming its leadership as the industry one-stop source for all skid steer tire and track needs. The addition of Camso’s skid steer product line complements its well-known offering of OEM and aftermarket skid steer tires, CTL tracks and Rubber OTT tracks. “Traditionally, Camso has offered rubber products, but we know our customers are looking for more than that. They’re in the market for off-the-road solutions. It’s our job to deliver high-performing products, whatever the application calls for,” says Andy Gaffney, Product Line Manager – Construction Tracks, at Camso. The move to a steel product now allows Camso distributors to offer the widest range of tracks. Camso believes a Steel OTT product is the perfect option should an application call for a track solution, but a user is not willing to bridge to a Compact Track Loader (CTL). “Compact Track Loaders are becoming increasingly popular and although our Steel OTT track won’t change your rubber-tire machine into a tracked machine, it will improve a skid steer’s traction, mobility and performance in extreme muddy applications when users need it,” adds Gaffney. With both rubber and steel options available in Camso’s OTT line-up, Gaffney is keenly aware of how each product meets different user needs. While all OTT attachments are designed to enhance skid steer traction and flotation, usually for short-term applications, rubber and steel tracks add distinctive qualities to the machine’s capabilities. 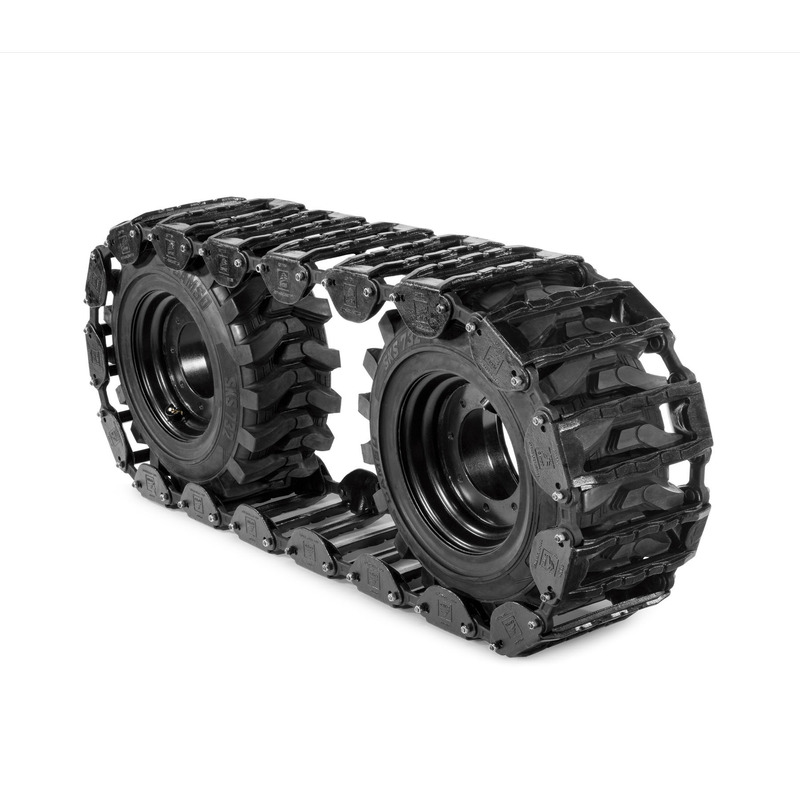 Camso’s new Steel OTT tracks are the ultimate solution for severe traction needs: on muddy terrain, muskeg or climbing over rock. The steel tread bars also have the cutting-edge operators need when working on heavy ice surfaces or on slopes. 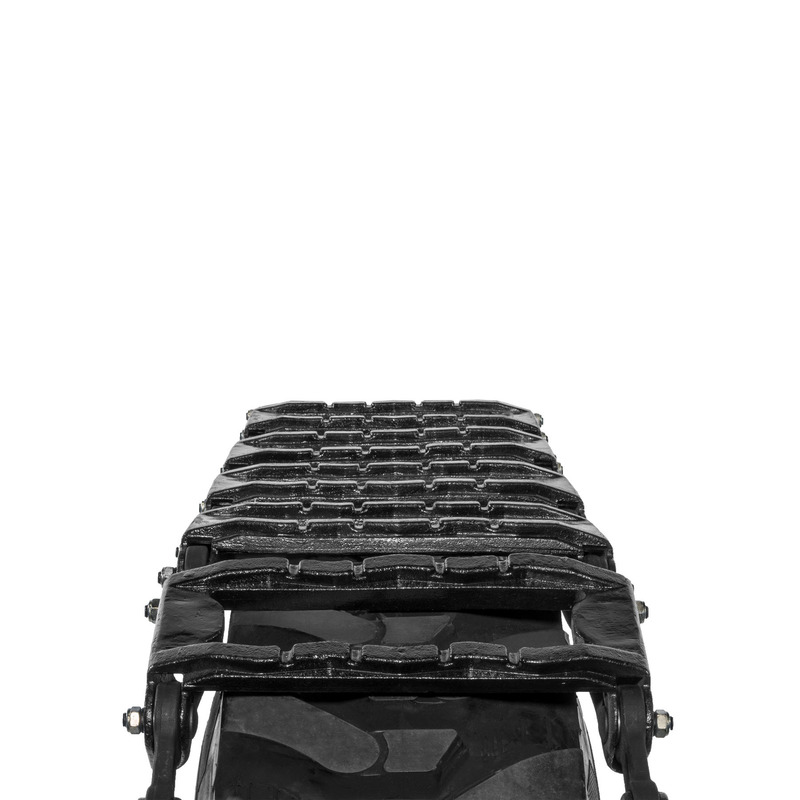 “Our Steel OTT tracks have been designed with wide voids between the tread bars, which makes clean-out very easy. And, of course, the steel construction is more wear-resistant than any rubber product,” continues Gaffney. Camso’s Steel OTT tracks allow a wide range of adjustment and tensioning, making them as close as possible to a one size fits all. The company will offer its Steel OTT tracks in 10” and 12” widths made to fit most skid steer loaders running conventional R4 tires. “An owner or operator can install these tracks in less than an hour,” says Gaffney. “You can quickly remove or adjust OTT links to fit the wheelbase, easily tensioning the track for 1” to 3” of sag. We feel the quick change and ease of installation will be attractive to get the user back to work in no time to maximize productivity,” he concludes. Camso Steel OTT tracks will be available through its dealer network in North America. The new tracks are already in production as Camso fills the pipeline to its nationwide dealers. A first public look at the new product, which will only be available in North America at this point, happened last week during the National Heavy Equipment Show in Toronto, Ontario, where Camso showcased a sample of the steel tread bars.